Recrystallisation is one of the most common techniques used in chemistry to purify a compound. Image by //www.flickr.com/photos/neofedex/ Original article published 25 Nov 2017. Updated 7 Aug 2018. When conducting a recrystallisation it is very important that you select the correct solvent. If you are following a procedure, it will most likely tell you which solvent to use. But when you are left to select the solvent yourself, there are several things to keep in mind. The ideal solvent will dissolve your product at higher temperature but not at room temperature. The idea is that the impurities will remain in the solvent after your product crystallises. A simple way to check if a solvent is suitable is to add a small amount of your product to a sample vial and add room temperature solvent. If the sample dissolves it is unsuitable. If you heat the sample vial you want the sample to eventually dissolve (although you may have to add more solvent). Common solvents for recrystallization include ethers, alkanes and alcohols. You’ve selected your solvent and you’re ready to begin, now what? You’ll need to set up a reflux condenser and add your sample to a round bottom flask. The liquid in the round bottom flask should not exceed the halfway mark so select the flask carefully. You want to dissolve the impure solid in the minimum amount of hot solvent. Start with a small amount in your flask and add more via the condenser until the solid has dissolved. Allow to reflux before cooling. 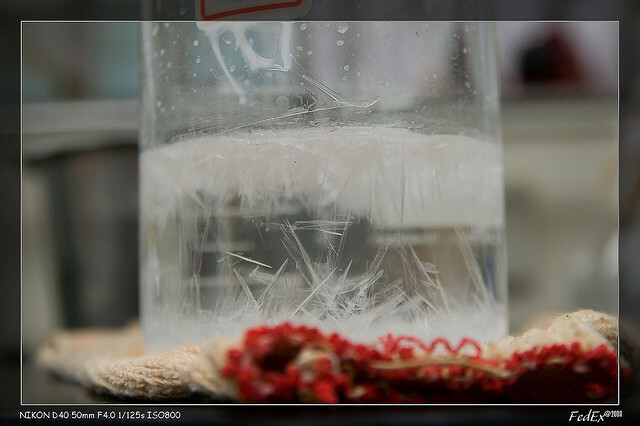 The more slowly you allow the solvent to cool, the larger the crystals will be. Filter off your solid and wash it with a small amount of cold solvent to remove any impurities that may be stuck to the crystals. Then leave this to dry – you may wish to do so overnight in a desiccator.